Earlier in September we placed two Potain IGO50 SETCs on Site in Edinburgh for a Scotland-based client. Both cranes are capable of lifting 1,250kg at the end of a 40m jib, providing a 23.2m Height Under Hook. They can also lift 4,000kg as far out as 13m from the tower. The Potain IGo 50 is one of the most popular Pedestrian Operated Tower Cranes on our Tower Crane Hire fleet as it combines maneuverability and capacity nicely. It is much easier to place on site than other material handling solutions and increases site efficiency while enhancing site safety. 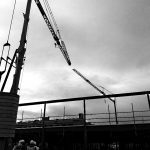 You can read more about the advantages of using a Self Erecting Tower Crane on your construction Project by clicking here. The Construction Project that our client is undertaking involves a residential development comprising of 82 apartments with associated works, parking and landscaping. It is due for final completion in April 2019, having begun in April of this year. 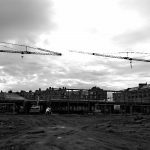 Our two Self Erecting Tower Cranes are due to remain on the project in Edinburgh for a duration of 30 weeks. 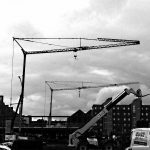 Is a Mobile Crane required to erect Self Erecting Tower Cranes? How are the Pedestrian Operated Tower Cranes operated?